This is a very elegant, contemporary hand-tied bouquet. Groups of crisp white flowers are beautifully framed by loops of steel grass. It’s simple in colour, but intricate in design, and the lilies give a sweet scent to the bouquet in Stonehaven flower delivery. Flowers Stonehaven offer a wide range of flower bouquets for every occasion and an excellent Flower Delivery Service across the North-East. The Expert Florists at Stonehaven Flowers are always delighted to help you in making your decision, whether you’re ordering for yourself or for a special someone. Each bouquet is carefully handled and arranged to the highest standard. Be it for a Birthday or a wedding anniversary, Florists Stonehaven can assure you that your recipient will not be disappointed. If you are unsure what you would like to include in your bouquet you can search through our online store as we have many stunning bouquets to choose from. Alternatively, if you know exactly what you would like to bouquet to look like, or what you find online is not quiet what you’re looking for, our expert Stonehaven florists will aid you in creating a personalised bespoke bouquet with you and your loved ones preferences in mind. Flowers Stonehaven want to ensure your experience with them is as memorable as the occasion itself. Stonehaven Flower Delivery offer numerous delivery option with you in mind. Our superb Same Day Delivery service is available which allows your beautiful bouquet from Stonehaven Flowers to be delivered on the same day as ordering. This option is perfect if you are running late with ordering or you had just forgotten. Whatever the reason, Stonehaven Flower Delivery will make sure the get your flowers sent out to you as soon as they possibly can. This ensures you or the one you have in mind will not be disappointed. Our delivery drivers are always more than happy to help in any way that they can to escape any inconveniences, for example arranging to have your delivery placed with a neighbour if your loved one is not in. Alternatively you can have your flowers provided with the standard delivery service which sees your order being delivered the Next Day. This service is available Monday to Saturday, throughout the year. With their extensive experience of over 40 years you can sit comfortably knowing your order is in safe hands. From the moment you place your order up until the point it is received, it is handled with caution. Whether it be a bouquet on its own or with balloons, delicious champagne or a cute teddy bear, your happiness is our priority. Throughout a vast network of Florists around the world, Stonehaven Flowers can be sure to have your presents delivered anywhere around the UK and over 140 other countries. 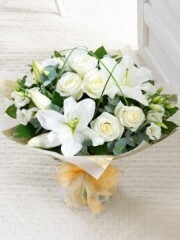 A Flower bouquet from Stonehaven florists is the ultimate gift to spoil anyone. To can rest assured that whatever the Expert Florists create for you, it will be an eye-catching piece. For further information you can simply contact the Florists Stonehaven and we can do our very best to assist you. You can telephone our store or send us an email with any questions or queries you may have about your special gift and Stonehaven Flowers will give you a response as quickly as possible.